In an article in The (Hobart) Mercury Park Beach surfer Mr Hollmer-Cross has called for more research to be undertaken. “There has been no hydrological or environmental assessments on why that spot has been selected as the optimum spot in Tasmania,” he said. Put them somewhere that no one surfs – there are miles of coastline that fulfill that requirement. Shane Abel has spent the past three years working on a proposal for an artificial reef at Park Beach, south-east of Hobart. Mr Abel has done extensive research on attempts to create artificial surf reefs around the world. The reef is constructed from HDPE, the same material used in fish farm cages. The reef is supported on timber piles and is above the ocean floor and not interfering with the littoral drift or sealife that live in the sea beds. The Wavebuster HDPE reef surface can be designed to match any world class reef within 20mm. 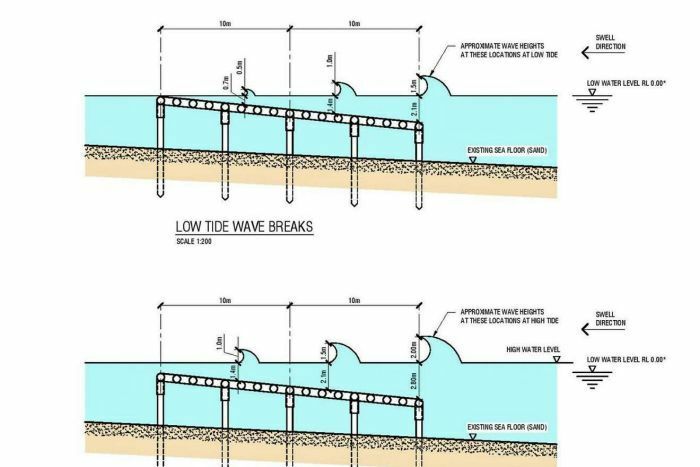 The reef slope can be set at any angle to incoming swell with 45 degrees being the middle ground with increased angle producing faster waves and decreased angles producing slower waves. Construction of the reef is simple with the piles driven from a barge and the reef fabricated onshore then floated out and sunk into position. Unlike rock or sandbags the Wavebuster reef can be removed easily if there any issues. Structures that resemble six-foot-long Quonset huts would be placed on the ocean floor in shallow water. Divers collect pieces of living coral that had been broken off by storms or ship groundings and attach them to the metal structures. Two buoys equipped with solar panels provide electricity through insulated cables. The electrical current will draw minerals from the water, causing the minerals to build up on the metal structures. Can this be done in a surf zone?